Caption slip reads: "Sunday or Monday. Photographer: Richardson. Date: 1951-09-25. Reporter: Swaim. Assignment: Navy baby, Pasadena. 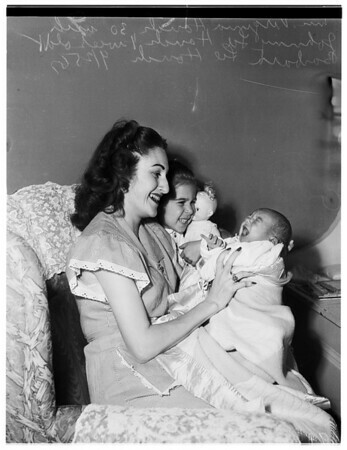 K9, 10: Mrs. Virginia Houck, 30, with Johnny Lee Houck, 1 week old, and daughter Barbara Lee Houck, 4 years. Father, Robert Lee Houck, has been in Korea with Navy since April".